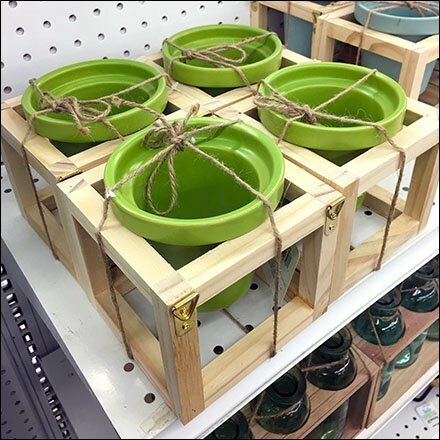 Part decorative upsell, part homespun packaging, are these Twine Tied Flowerpots in Wood Carriers. The twine and wood frame anchors and protect the merchandise. You might even use the twine after the fact to suspend the wood frames (see that hangers are included). In any case, presenting this way surely commands more attention and a better price. Consider Twine Tied Flowerpots in Wood Carriers in the gallery of images. Seen at JoAnn Fabric and Crafts.